Macky Sall’s party, the Benno Bokk Yakaar (United in Hope) coalition won 119 of the 150 seats (79.3%) in the just-concluded legislative elections in Senegal. President Sall assumed office this year after defeating former President Abdoulaye Wade who had been in power for over 12 years. Mr. Wade’s party got a total of 12 seats (8%). In the last legislative elections (2007) Mr. Wade’s coalition won 87.3% of the seats. Turnout in Sunday’s poll was a paltry 37% – a 3 percentage point improvement from 2007 (According to the African Elections database). President Sall’s big legislative win is a bad omen for democratic consolidation in Senegal – and a sign of a shaky party structure characterized by unstable cycling super-majorities (see here). One would have hoped for a more competitive showing by former President Wade’s PDS in order to provide a formidable check on the president. With these results Sall might also fall into the temptation of trying to legislate his opponents out of political contention just like Wade did, and succeeded for a while. UPDATE: The BBC reports that riots erupted in Dakar after a court in Senegal declared President Wade eligible to run in next month’s general election. President Wade will be seeking a third term in office. It looks like Senegalese may be forced to live with their country’s model of soft authoritarianism with reasonable levels of political competition for a few more years…. He may be at least 86 years old with 11 years as president behind him, but Abdoulaye Wade, Senegal’s president, says “he does not feel his age”, and is determined to serve another term and preside over a “generational transition” before retiring. “In Africa we do not reason in terms of age. You find village chiefs who are 100 years old. So long as you have your wits about you, in African tradition age has advantages: wisdom (for example).” After seeing off rival veterans in polls scheduled for February 26 he would be the “last barracuda among the little fish”, he predicted in an interview in Dakar. Senegal’s constitutional court will decide on Friday if the President can indeed run for a third term. Mr. Wade pins his hopes on legal gymnastics, insisting that the constitutional term limits enacted during his first term in office only went into force at the beginning of his second term. Perhaps anticipating the outcome of the court ruling, the government has instituted a five-day ban on public protests beginning tomorrow (Thursday 26/1/2012). The opposition has vowed to carry on with protests should the five-judge panel of the constitutional court approve of Wade’s candidacy. Many suspect that Wade’s insistence on running for reelection this year is part of an elaborate plan to have his unpopular son, Karim, succeed him. Karim unsuccessful tried to become Mayor of Dakar, the capital, in 2009. He is presently a “super minister” in his father’s government, overseeing dockets as diverse as energy and power, international cooperation, regional development, aviation and infrastructure. The truth be told, the fact that Wade could even contemplate a third term is an indictment of the Senegalese opposition. They have consistently failed at uniting against Wade and have been more than willing to be bought off. Mr. Wade is well aware of this and did pass a law which permits the President of Senegal to be elected with only 25% of the vote. It is still possible that the unpopular Mr. Wade may lose even if he gets his way in the courts. More on the FT report here. La Pointe des Almadies is Dakar’s wealthiest neighborhood and it teems with expat NGO workers and the palaces of government officials. Recently, the construction of an immense statue, “The African Renaissance Monument”, a 27 million dollar project commissioned by Senegal’s president, Abdoulaye Wade, has transformed the neighborhood’s landscape. The imposing bronze figure of a muscled man, one arm protectively wrapped around a woman, the other triumphantly holding up his infant child, sits atop a hill overlooking the city. 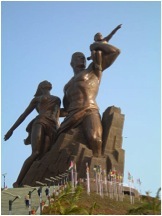 The statue and Wade’s current projects for the construction of the “Seven Wonders of Dakar” (a section of the capital which will include a new National Theater, Museum of Black Civilization, National Library; the School of Fine Arts and the School of Architecture and Music Palace) are seen as wastes of government money spent to satiate the President’s desire for a legacy rivaling Senghor or even the grand public projects of France under past presidents Chirac and Mitterand. Growing discontent with Wade’s attempts to stay in power past the current two-term limit and with what is perceived to be his inability to ensure reliable infrastructure to his country’s population has culminated at times with criticism of “The African Renaissance Monument”. Most of Dakar’s neighborhoods experience daily power outages and terrible traffic due to poorly maintained and inadequate roads. However, Wade has somehow scraped together enough money to build bronze statues and to build a second national theater to replace the centrally-located and historical Théâtre Daniel Sorano in downtown Dakar. I am not an expert in development. I am a historian whose interest in West Africa began as a Peace Corps Volunteer in neighboring Mauritania but I have found myself progressively less optimistic about prospects for change in the daily lives of most West Africans I know. 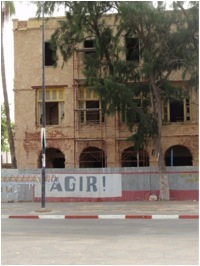 On a recent research trip to the northern Senegalese city of Saint-Louis, I was struck with how much more run-down the city seemed to me than it had my first time there in 2003. While Saint-Louis can be picturesque from afar, with its 350 year-old colonial facades built on its central island, the reality is that its infrastructure is disintegrating. Despite the presence of NGOs (visible by the many white SUVs and walled compounds marked by their painted slogans of “Espoir” and “Aide”), it’s hard to see signs of successful projects. As I walked through the city, I couldn’t help but notice numerous failed plans. I passed dead trees protected by reed fencing where someone had thought plantings along the streets of a popular neighborhood would be a good idea. Talibés (students, or little boys sent out to beg for money and food by some unscrupulous marabouts) are an ever-present part of Saint-Louis streets despite heavy investment by NGOs to provide the boys with reliable food and housing. The shores of the city are lined with old tires, plastic bags, and fish remains. As I looked in at a dark closet where thousands of colonial documents sit waiting to be organized and made accessible to the public, the regional archivist also told me that plans to build a much needed space to securely house the country’s archives had been shelved years ago in favor of the construction of the Piscine Olympique, Dakar’s largest swimming pool. Riding in a crowded bush taxi and hitting the crawl of traffic on the way back to Dakar, I couldn’t help but wonder what prevents these initial investments in tree plantings, child welfare protection and road construction from being maintained. From this perspective, much of the failure of such development projects seems to be explained by a lack of investment in the maintenance of current projects. Perhaps this can be explained by the framework of funding and the reluctance on the part of donors to provide for anything other than new projects. (After all, it’s much more exciting to say that Dakar will benefit from a new, state-of-the-art performance space than the rehabilitation of its old theater space.) Or maybe funding agencies and donors find it difficult to collaborate on projects such that one agency might undertake an initial trash clean-up while another would ensure that a second clean-up is planned a month later. Possibly there is also a lack of coordination between funding agencies and local governments who, once the preliminary heavy investment has been made by development agencies, could then continue the programs with less funding but with longer term results. Projects initiated by African governments also need to consist of more than an initial flood of money but should also include funding to be set aside for the continued and regular maintenance of such projects so that they remain relevant and useful. To emphasize this point and to return to my original starting point of La Pointe des Almadies, one only need to look at the pathetically barren palm tree trunks lining Dakar’s prettiest drive from downtown to the “Renaissance” statue that overlooks the Atlantic Ocean. 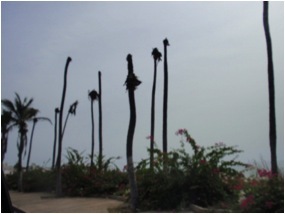 Abdoulaye Wade requested the planting of hundreds of palm trees along this drive to welcome delegates of the Organization of the Islamic Conference who met in Dakar in 2008. Now, three years later, the majority of these tress are simply reminders of another failed project. Inadequately or never maintained, the trunks stick out of the ground, their tops bare and exposed, they stand isolated and quivering no longer serving a purpose. I’m sure they looked beautiful in the first weeks they were planted but have become symbols of the emptiness of similar endeavors. I know that there are successfully sustained projects out there but it’s difficult not to feel disheartened by the many visibly failing projects aimed to satisfy a short-term goal or donor stipulations rather than the actual needs of a struggling population. Erin Pettigrew is currently conducting dissertation research in Senegal and Mauritania. Abdoulaye Wade is a study in delegative democracy gone crazy (In the words of Paul Collier, democrazy). Delegative democracy is the phenomenon of elected leaders going rogue and essentially performing auto-coups (mostly through constitutional gymnastics) in order to entrench themselves in power (see O’Donnell). Leading lights in this regard include Hugo Chavez of Venezuela, the late Frederick Chiluba of Zambia, Vladimir Putin of Russia and Thaksin Shinawatra of Thailand. Mr. Wade’s latest assault on Senegalese democracy has been his attempts to lower the threshold for the election of a president to a mere 25% down from 50%. He’d much rather win cheap against a fractured opposition in the first round than risk a runoff against a single opposition candidate. After 11 years in power without much to sing about the risk is just too high for the Wade regime. President Wade also wanted to create the position of an elected vice president before the 2012 elections. Many believe that Wade had his son Karim in mind for this new post. In the end determined opposition protest outside the Senegalese parliament forced the president to withdraw the draft legislation. If the opposition unites [and that is a big IF], they could beat Mr. Wade in 2012. Frequent power cuts, a flagging economy, rampant inflation and Wade’s brand of crass and tone deaf nepotism (he wants to be succeeded by his own son despite the revolutions the Islamic near-abroad) have served to alienate the aging leader from many voters, particularly in urban areas. Mr. Wade is expected to run for a third 7-year presidential term next year. He is 85. Abdoulaye Wade, president of Senegal has signalled his intentions of making his son a political force in the country by appointing him minister of energy. Wade, 85, is due for reelection in 2012 and has indicated that he will run for a third term. In 2008 the Senegalese assembly voted to extend presidential term limits from 5 to 7 years. It must be nice to be 85 and still have such a promising future ahead of you. Abubakar Diakite, the guy who almost assassinated Guinean dictator Moussa Camara, should be handsomely rewarded. Well, unless he was actually responsible for the massacre of more than 150 pro-civilian-rule opposition protesters last year in which case he should be tried for crimes against humanity and locked away for life. Either way his actions may have put Guinea on the path towards civilian rule. Capt. Camara has agreed to “voluntary exile” (yeah right) in Burkina Faso. His henchmen (now led by his second in command) have also agreed to hand over power to civilians after a six-moth transition period. All active members of the armed forces are barred from running in the elections to be held in six months. This is a good start, although things may yet change. In other news, the Senegalese President (Abdoulaye Wade) is not smart. Haitians do not need Senegalese land. Haitians need to get their act together in Haiti. He is like the bleeding hearts who are willing to help strangers in foreign lands while their own relatives starve. Senegal has an income per capita of $1600. Life expectancy stands at 59 years. The country also has the 40th worst infant mortality rate in the world. Mr. Wade’s nonsensical grandstanding is an embarrassment. The events in Senegal last Monday are yet another blow to the democratization of a very undemocratic continent of Africa. Senegal has always been a beacon of hope and a symbol of sobriety in the most turbulent region of the African continent. But even its impressive track record could not stop Abdoulaye Wade, one of the few African leaders I have respect for, from extending the presidential term from five to seven years. Why Wade, why? At a time when you are criticizing Mugabe for being a despot, don’t you think it is inappropriate for you to extend your own term? The Senegalese parliament should go jump over a cliff for this.